Here at Creative Custom Builders we are all about creating high quality spaces that are as unique as you are! While we tend to focus on building the home or town home of your dreams (we are contractors after all) throughout the years we have picked up a few tricks and tips for once you are all moved in! Below is a list of some of these shortcuts. These are sure to make things easier for you and keep your belongings organized! 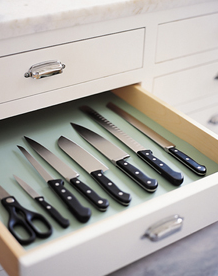 Storing sharp knives in your kitchen drawer makes for a less-cluttered counter and a safer kitchen. But with each pull of the drawer, sliding knives collide and in turn dulling and damaging their finely honed edges. Artists’ drawing-board liner (available at art stores) has a slightly rubbery surface that will keep your knives in place and wipes clean easily. Cut a piece of liner to fit the bottom of the drawer, and anchor it in place with double-sided tape. 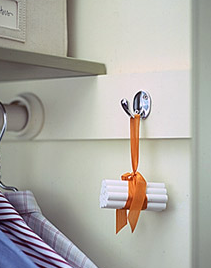 Keeping a bundle of chalk hung in a closet will absorb any extra moisture and keep your clothing fresh and dry! This also takes up much less room than an electric dehumidifier. Simply fasten a rubber band around the bundle of chalk, tie a ribbon around it and then hang! The same felt glides that keep scratches off wood floors keep pants and shirts on wood hangers! Stick two glides onto the hanger where you would be hanging your shirts or pants and test it out! They will no longer fall into a wrinkled mess on the bottom of your closet. To whiten cloth napkins, linens, and even socks, fill a large pot of water, and drop in several slices of lemon. Bring to a boil, then turn off the heat. Add the linens and let them soak for about an hour. Then launder as you usually would. Your linens should be whiter than ever after this trick! 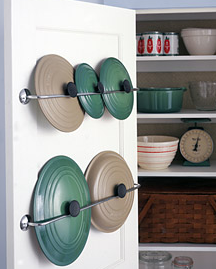 Are you sick of your pots and their lids taking up all of your cupboard space? Nest the pots together and give the lids a home of their own! Install metal tower bars inside your pantry door. (Look for simple ones that stand out about 2 inches.) Mount them only to the rails of solid-core wooden doors. To hang a lid, simply slide it behind the bar so the knob or handle catches and holds it in place. Now that you know some of our favorite shortcuts, only one question remains. Which one of these will you try first? !